Arayo in our tornado shelter. She will never enjoy this season. How do I write this without sounding heartless? Maybe if I start with how sad I am at the destruction and lives lost today in Moore, OK. The tornado that roared through that town, taking out two schools and killing dozens - I hate that. I still feel a sense of unease when I go to Joplin and drive the streets that two years ago were leveled when a tornado went through their town. Still, there are those among us who love tornado season - though, it is with a sense of respect for this bit of nature and of sensitivity to the losses these monsters produce. But, I admit it - I am one of them - I love tornado season. I LOVE it. I missed it when I lived other places. There is an excitement when the weather changes, when rain drives in sheets, and the thunder and lighting battle in the night. You can't really explain it to people who aren't from here. There is a change in the air. The sky often turns this strange yellow/green….. There is often the quiet before the storm. Then there is the social aspect. Neighbors reach out to neighbors. "Have you heard we are under a warning?" "My basement is ready if you need a place to hide." Arayo will admit to not sharing my love of this season. To her there is a feeling that we are no longer in control. She senses the danger. She needs a hug and wishes it would all just stop. I hold her a while, then wrap her in a t-shirt so she feels she's being hugged. I'm not sure if it helps. Today I cleared out the floor of a closet in the center of my house. On further reflection I decided that perhaps the 30 pound camera and metal case on the upper shelf in there might need a better home. No sense taking shelter from a storm only to be killed by falling camera gear. When the weather kicks up the phone starts ringing "do you realize we are under a warning?" I, of course, rush outside to see what's up - until the limbs on the trees bend to the ground…..
Today the sirens actually went off in town. I'm suspicious. From what I could tell, they didn't sound until we'd been lifted from a warning to a watch - so I have to wonder when they really should have fired off and why they sounded at all today. I'm less than trusting of this warning system. But, it let me try out my hidey hole. Sharing it with clothes, a computer and a 100 pound dog - it was hot, cramped. I had NO cell phone reception. i wasn't anxious to stay long. 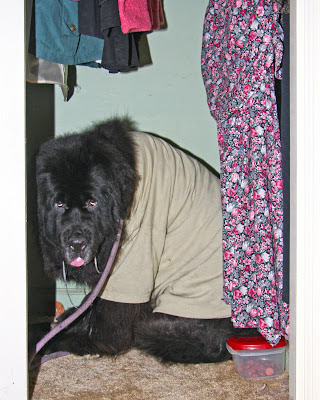 Arayo had no problem with the closet. In fact, she went in before me and stayed long after I was gone - content to wait in a clothes padded cave than rather than with me near a window. We are probably in for more of this weather. Excitement, terror. It makes up for the otherwise rather flat existence that is Kansas.